Today's website shows what seems to be some kind of confrontation between PM and one of the fledglings, which Lincoln believes represents PM beginning to chase the fledglings away from that particular territory. Do you think this is what's happening -- or would you have another explanation? I believe there was a pix within the last few days of one of the fledglings sitting on top of the Beresford, which is definitely part of PM's territory. Do you think this may have sparked PM's aggressive action toward the fledgling? Or is it possible for them to stay around, as long as they're a suitable distance away from the area PM claims? Remember Junior/Charlotte -- they were down at Central Park South, which does give some room away from the 927 area, yet remaining in NYC and within the general area of CP. I haven't looked at Lincoln's photos on this, so I don't know the particulars. But it's now September, and the days are getting 4 minutes shorter each day. For the hawks, everything is changing. Summer is gone; fall is here. It's time for immatures to get serious about migrating and moving out. So yes, Pale Male's "interaction" with an eyass may have an element of parental "motivation" to get the immatures to move on out. I don't think "chase" is the proper word. That implies physical contact and so forth. But this can be a psychological "nudging," a parental displeasure with immatures tending to linger and wishing to mooch off the provisions of the parents. That worked in July and August, but Pale Male won't be caching or dropping much prey for his eyasses now. The matter is not much related to prey availability at this time of year. Yes, if Pale Male and his consort allowed it, and the eyasses likewise agreed, they could remain well-fed in Central Park through the autumn and winter. But that's not how Red-tail biology works. 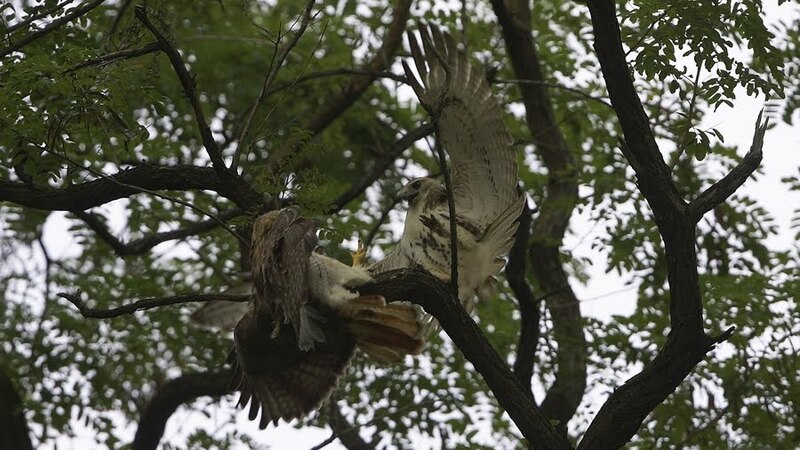 If that were allowed, there would be an annual accumulation of persisting young hawks who would, sooner or later, overwhelm the prey resources of the local territory, even those of Central Park. So, young Red-tails are motivated, both by instinct, and gentle parental nudging (perhaps as photographically noted by Lincoln Karim), to respond to internal urges to migrate. Most likely, the Central Park eyasses will soon just disappear from the scene. At an opportune moment they will loft into the Manhattan sky, catch a rising thermal of heat rising above the hot urban streets and buildings, and within a few minutes find themselves at several thousand feet. From there, it's only a matter of turning to the south (or to the west) to be soaring above New Jersey. And while aloft, the Central Park eyasses will easily spot the many other immature Red-tails also drifting south. Red-tails don't migrate in close groups or formations (Broadwinged Hawks do.). Still, they tend to move in widely-spaced groups. The Central Park immatures will easily affiliate and join such a soaring mass. So, any day now, Pale Male's 2011 progeny will depart. It's all very natural and normal; an important part of Red-tail biology. Pale Male and his mate will have no such migratory urges. They will remain in residence, with the autumn a season of relative ease for them. No eyasses to feed or watch out for. Life will be good. 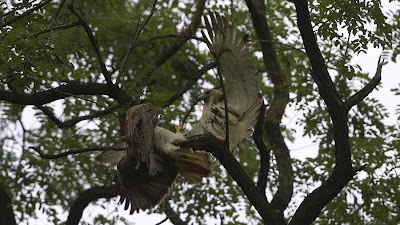 Lots of migrating Red-tails coming down the Hudson from more northern latitudes will fly over Central Park, but Pale Male and his mate will recognize that these birds are merely moving through, and pose no threats to the integrity of their local breeding territory. have begun and the territory will be strongly defended once again.